We who live and toil along the Wasatch Front are damned lucky to have so many good Thai restaurants in our midst. Like you, I have my favorites, although I can honestly report that I’ve never had a bad meal at a Utah Thai eatery. Well, I’ll need to make room on my list of favorite Thai restaurants—right at the top or very close to it—for an outstanding new one: Skewered Thai. About the only thing I don’t love about Skewered Thai is the name. Maybe I just don’t get it. But it’s not as if kabobs or other skewered foods are the restaurant’s mainstay. There is the usual skewered beef and chicken satay, but that’s about it in the skewering department. “What’s in a name” aside, the restaurant is charming. It’s located near Trolley Square in the brick house that was home to Elizabeth’s English Bakery before that business relocated. From the exterior, the place looks tiny, but inside it’s surprisingly roomy. Old wood floors, exposed brick walls and dark tables and chairs lend a warm ambiance. And, pleasingly, the restaurant is bereft of the typical all-too-kitschy Thai knick-knacks and bric-a-brac. A handful of outdoor tables adorn the patio adjacent to the restaurant. There are a couple of must-try sharable appetizers on the menu. The fresh spring rolls ($8) are remarkable—a taste of spring itself. Rice paper skins are rolled with cucumber, bean sprouts, spring lettuce, carrot and mint, then sliced into eight bite-size portions. The springs rolls would be delicious just as they are—“naked” —but are a real knockout with Skewered Thai’s housemade peanut sauce for dipping. Skewered beef and chicken satay ($9) also come with that perfect peanut sauce. The meats are marinated in coconut milk and Thai herbs before being skewered and grilled. I really liked both versions, but the chicken was particularly memorable. The four plump portions of boneless chicken breast were lightly charred and remarkably tender, juicy and full of flavor, adorned with paper-thin cucumber slices and julienned carrot. Other “small bite” temptations include fried Thai calamari with a spicy-sweet chili sauce ($9), curried puff pastry with potato stuffing ($8), and, although I normally wouldn’t go anywhere near coconut fried shrimp ($9), Skewered Thai’s version, with coconut batter, is another matter entirely. I have to admit that Skewered Thai hadn’t appeared on my radar until Takashi and Tamara Gibo—of Takashi’s eponymous Japanese restaurant; they know a thing or two about great food—turned me on to it. The owner of Skewered Thai, a very talented woman named Lek Changkiendee, worked with Takashi many years ago at Shogun, before he opened Takashi. In more recent years, her Thai food cart was a fixture at Park City’s Silly Sunday Market. She saved money from the food cart until she became able to open her own restaurant. 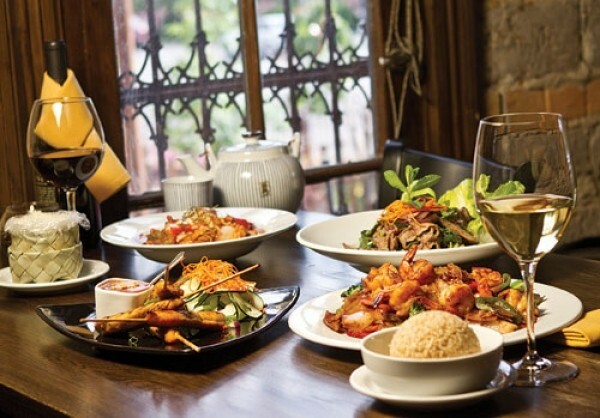 Her brother—well-known local wine expert, restaurant manager and bon vivant Ty Richchouyrod—helped her put together the small well-focused Skewered Thai wine list. He’s chosen well-made wines that pair beautifully with Thai cuisine; you won’t find any Super Tuscans on the list. Naturally, we had to sample the pad thai ($12), a staple of virtually every Thai eatery I’ve ever visited. As with many Skewered Thai dishes, diners who order pad thai can opt for getting it with tofu, chicken, beef, pork, shrimp, scallops, mussels, squid or veggies. There’s also a choice of rice noodles or glass noodles, the latter of which are made from bean and also sometimes called cellophane noodles or bean thread noodles. We opted for shrimp for the protein and the rice noodles, which are a little less delicate than glass noodles. The pad Thai was scrumptious: stir-fried noodles tossed with shrimp, scrambled egg, scallions, crunchy bean sprouts and carrots in a simultaneously tangy and sweet sauce with ground peanuts on the side. Even better than the pad thai, if that’s possible, was a wicked-good noodle dish called pad kee mao, or drunken noodle ($12). This was a platter of wide, pan-fried rice noodles and a distinctively spicy mélange of tender shrimp, red bell pepper, mushrooms, broccoli, carrot, tomato, fresh chili, egg, onion and fragrant Thai basil, which nicely balanced the heat of the chilies. Another zippy offering is the Thai-style pork salad ($14). It’s a spicy blend of grilled pork, ground and mixed with scallions, white onion, tomato, cucumber, bell pepper and lime juice, served with fresh lettuce leaves for assembling lettuce cups at the table. The som tum salad ($14) is also an excellent choice: shredded green papaya with shrimp, carrots, tomato, peanuts, green beans and Thai chilies tossed with a hot and sour Thai dressing. Of course, there is the traditional range of Thai curries at Skewered Thai: red, green and yellow curries, panang curry and even pumpkin and pineapple curries, all with a choice of protein or vegetables. The curries are very well balanced; not too sweet and not too spicy. I really loved the flavor of the massaman curry ($12) with tender slices of pork bathed in a coconut milk broth with white onion, potatoes and carrot chunks. Unfortunately, the potatoes and carrot pieces were a bit undercooked and crunchy—the only glitch I could find at Skewered Thai. Satiated, but not quite finished, we tried the coconut sticky rice with mango slices ($7), which solicited OMG! responses all around. How could anything so delicious not be totally unhealthy? We can’t wait to be Skewered again.